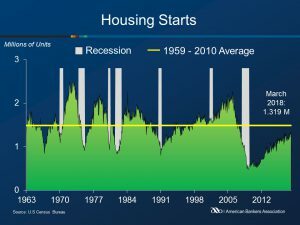 Housing starts increased to a seasonally adjusted annual rate of 1.319 million in March, according to the U.S. Department of Commerce. The figure was 1.9% above the February rate of 1.295 million and 10.9% higher than the March 2017 rate. Single-family home slipped, falling 3.7% from last month. However, multifamily jumped 16.1% since February and 23.7% since March 2017. Housing activity decreased in two of the four regions as the Northeast and Midwest grew 0.8% and 22.4%, respectively. The South and West fell 0.6% and 1.5%, respectively. New building permits rose during the month, increasing 2.5% to 1.354 million. Multifamily led the increase, surging 22.9%, while single-family building permits fell 5.5%. New building permits were up 7.5% from the March 2017 rate. Housing completions were at a seasonally adjusted annual rate of 1.217 million, down 5.1% from the February estimate and 1.9% above the March 2017 rate.